The owners of Cardiff Arms Park have said they are willing to discuss a new lease with the Cardiff Blues to "secure the future" of rugby at the ground. 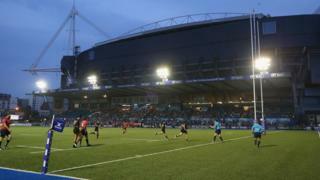 Cardiff Blues want to give it a multi-million pound facelift but the plan was rejected by the ground's owner Cardiff Athletic Club (CAC) earlier this year. CAC called the proposal a "risk" due to concerns over the Blues' finances but has asked for more details and clarity. It said a new lease was a "more appropriate" option instead. The Blues share the stadium in a lease which runs until 2022. Plans were announced in 2015 to secure a new 150-year lease which would allow the Blues to redevelop the ground and build a hotel, exhibition centre and flats. A 15,000-seater stadium with a retractable pitch and sliding roof would also have been created so it could be used as a concert venue. A document seen by BBC Wales revealed the CAC rugby section chairman said it was "on the point" of signing this deal earlier this year, until the Blues' annual accounts were published. The Blues have been asked to comment.